Has Fido or Fluffy Become Forgetful? As our beloved pets get older, the ravages of age seem to creep up on us. The symptoms of old age are often not noticed until ailments are quite advanced, or pointed out by family or friends who may notice more distinct changes over time. Arthritis, loss of exercise tolerance, blindness and deafness are often associated with age, as too are some quirky and unusual behaviours that many of us attribute to the before mentioned conditions. The fact of the matter is that dogs and cats can suffer from a form of dementia we refer to as cognitive dysfunction syndrome. Cognitive dysfunction syndrome is associated with loss of brain cells, a build up of toxins and damaging free radicals within the brain and possibly even reduced blood flow to the brain. Symptoms are sometimes not obvious until several years after some of these changes begin to occur. Pets may become disoriented or confused in familiar environments. These changes can be as subtle as going to the wrong side of a door or getting lost on a walk. 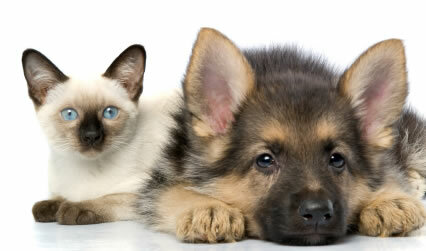 Pets may interact differently with other animals or people, becoming disinterested, less playful or even more irritable. Abnormal sleep-wake cycles are often more easily noticed as they can be quite disruptive to the human inhabitants of the house. This is often manifested as waking and vocalising during the night and often sleeping for the duration of the day. Loss of learned behaviours for most pets is most easily recognised by loss of toilet training and is often confused with incontinence or difficulty making it outside due to arthritis. Their general activity may alter, ranging from being less active and losing interest in grooming and eating to compulsive disorders such as excessive licking behaviour, pacing and aimless wandering. If cognitive dysfunction syndrome is suspected, a number of measures can be taken to alleviate symptoms. Providing mental stimulation and gentle exercise through games and playing has been shown to slow the progress of cognitive decline. Special diets have been formulated with numerous antioxidants and are proven to improve brain function in patients with cognitive dysfunction syndrome. In addition to this we now have medications available specifically for this condition which improve blood supply to the brain. So while we can’t cure our pets of ‘dementia’, we can certainly take steps to make the world a less confusing place for them. Pets with cognitive dysfunction syndrome are generally elderly and many common ‘old-age’ conditions can produce some of the same symptoms, so it is important to have these problems checked out by your vet and to not assume your pet simply has ‘dementia’. If you have any concerns, don’t hesitate to contact us on 3202 7300. Asher Dessaix -Anstead Veterinary Practice.